The Crow is still a favorite of mine! I must have watched this movie about 20 times on VHS as a kid and teenager, so I might be a bit biased in my rating. The setting, the mood and everything about the movie is just how I felt like my life was like growing up as a teenager, so I will always have a soft spot for it, I guess. The movie is based on a comic that I have never read, so I have no idea how it corresponds to it. Though the plot is very straightforward; tragic incident, revenge on minions, revenge on main villain and then return to peace, it is solid and still the basis for many good movies. You know what is going to happen and you cannot wait to see it. All actors playing the bad guys do a great job. T-bird and his gang seem convincing, and Michael Wincott playing Top Dollar is downright scary! Ernie Hudson’s performance is a bit below average (and what is up with this lack of ability to act like a smoker??) 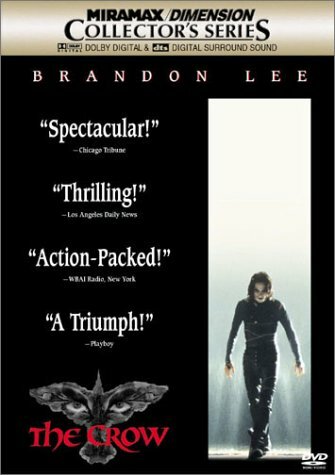 and at times Brandon Lee’s performance also drops below the line in my opinion. Tragically Brandon Lee lost his life on set which is very sad, as the kid had potential and it must have been awful for both family and fellow crewmembers for the movie. Effects are standard good for an action movie and the soundtrack is brilliant. I think I have listened to that even more than I have spent seeing the movie - which is saying a lot with this particular movie! Watch it is you like dark sombre movies, if you like the comic book, if you enjoy vigilante movies or if you are a disgruntled teenager who is into hard rock and angry movies.